So there I was, supposed to be flying to Omaha Nebraska for an entire week to go watch my oldest brother graduate from dental school. I was excited to spend time with family but bummed that I would be gone all week cause that would mean an entire week I couldn't spend with Jason. I looked up flights (to see if I could schedule later in the week) and flights were about a million dollars just to change it by 3 days, so I let it be. Jason took me to the airport for my crazy early morning flight that Monday and dropped me off. I had a layover in Denver and as luck would have it, the plane was having some issues and my flight was delayed. Eventually the airport people said that everyone with a connecting flight would need to rebook since the plane was delayed so late, all the connecting flights would be long gone by the time we landed in Denver. I waltzed on up to the front desk and rebooked for Thursday. Excited, I quickly told Jason about the good rebooking news! When I finally got home from the airport, Jason let me know that he had to coach volleyball all day and get his team ready for state andddd he also had the volleyball end of the year banquet that night. I caught up on sleep and got things done while he was busy at "volleyball" all day long! He came over in between practice & the banquet to hang out for a little and suggested we celebrate my canceled flight by going to dinner after the banquet. And he told me I should dress up. Naturally, I questioned him. c- why should I dress up? is there something I should be dressing up forrr??? j- I'll be dressed up so I thought it'd be good! c- okay, so we're going to do dinner anndddd...? After a 2 second interrogation, I stopped my questions and said goodbye as he left for the banquet. I didn't actually think he would propose that night, we had been talking about getting engaged a lot lately and I knew it was coming any day, so I was in full skeptic mode. Anyways, later that night Kelsey (the roomie) was going to go on a run and invited me to go with! I declined cause I had to get ready for dinner still. Kelsey left and I took my sweet time getting ready. 10 minutes later, Kelsey called in a frenzy and was sobbing and CLAIMED it was because her parents told her some terrible news having to do with her schooling. She asked me to come pick her up right away. Me, thinking Kelsey was terribly upset and in need of comfort, ran to my car and raced to go grab my poor innocent little roommate. She was sitting at the mouth of a neighborhood. When I pulled up, she asked me if I would go on a walk with her to talk about it. I bought her story and parked just inside the neighborhood. Inside the neighborhood is a lake and a cute little dock that Jason and I have gone to and had a lot of awesome talks there. It's our special little place to go together. Anywayssss, I got out of my car and Kelsey started walking towards the pitch black dock. I questioned her and let her know it was a dead end (cause it's just the dock!) and she claimed she had never been there and wanted to check it out. We kept walking and I thought I saw a figure at the end of the dock, I mentioned it and kelsey just dismissed me quickly. 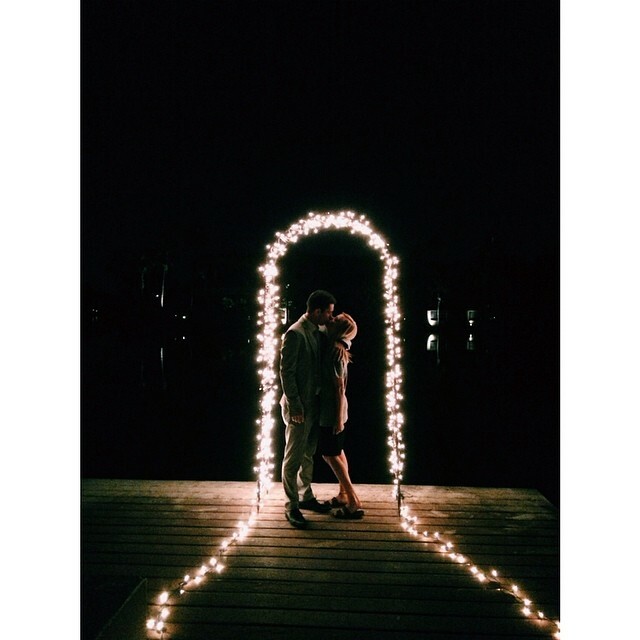 As we got to the start of the dock, lights turned on, lining it, kelsey walked out of sight, and all I could see was Jason, standing at the end of the dock under a lit up arch. I walked up, in full shock, and reunited with my future husband. 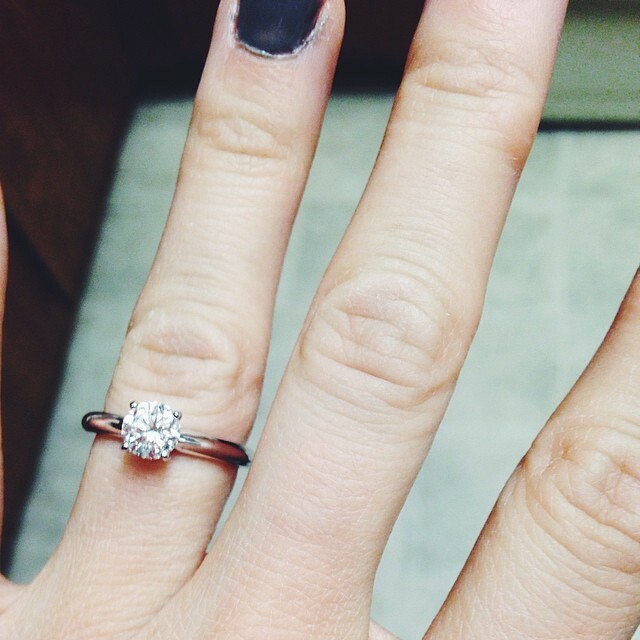 He said a lot of sweet things, knelt down on one knee, and proposed. Anddd I, of course, said yes! Memories of the engagement: I was wearing gym shorts and my BYU I gym shirt. WHY! I always do my hair + makeup first and then change into cute clothes. When Kelsey called me, I literally thought someone had tried to jump her or something (dramatic, I know) so I didn't even think of changing, I just freaked out and went off to find her. When I walked up to Jason, I remember I couldn't believe it was happening and I couldn't believe I was wearing ugly clothes haha he kept telling me not to worry about it as he poured out his sweet heart to me. People who came: Kelsey, Tanner, Weston, Aaron, Hannah, Bryan, maybe others but I can't even remember! After the engagement, J and I went and got takeout wings from Applebees. Jason had suggested celebrating at Olive Garden but I just wanted a quiet night at his house to spend with him and share the news with friends and family. Yay!!!!! I've been waiting for the full story! Soo sweet. I can't wait for you two, you guys are the cutest!! And atta boy on popping the question Jason, and on that ring! BEAUTIFUL! Jules Doodnath @ DJ&H Process Service Inc.